Joining the company's E Series, the new projectors are portable and feature 3 LCDs, brightness of 3,100 lumens to 4,300 lumens, a contrast ratio of 20,000:1 and resolutions of 1,024 x 768 or 1,280 x 800. Other features include dual HDMI ports, IP control and wireless connectivity. 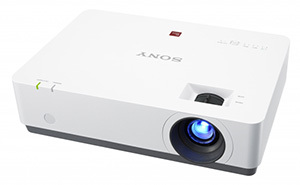 "The continued evolution of our popular E Series is Sony's commitment to our partners to provide a full-featured projector line-up," said Yoshi Koike, marketing manager for business projectors at Sony, in a prepared statement. "The new E500 and E400 series bring to the market a robust and cost-effective range that is easy-to-use and reliable while offering good picture quality for mid-sized classrooms and meeting room environments." Three of the new projectors, the VPL-EX575, VPL-EX455 and VPL-EX435, are slated for availability in April. The other four, the VPL-EW578, VPL-EW575, VPL-EW455 and VPL-EW435 are scheduled for release in May. 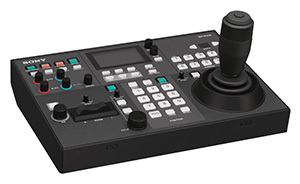 The new controller, the RM-IP500, features a joystick for one-handed pan-tilt-zoom (PTZ) control and allows for user customization, with the ability to move zoom control to a rocker button, a knob for controlling PTZ speed, and programmable buttons for frequently used functions. The controller is designed to work with the company's BRC-H800, BRC-H900, BRC-X1000, and SRG-360SHE PTZ cameras and its MCX-500 HD switcher and supports SD card recording and IP streaming. It features an auto IP setting to simplify IP assignment for up to 100 cameras and 16 preset camera angles, with the ability to program up to 100 coming soon. "The RM-IP500's simple setup, portable size and flexible options let PTZ users create an efficient and cost-effective lecture capture or event production system," said Terry Huber, senior marketing manager for remote communications, in a prepared statement. "With flexible zoom patterns, speed control options, presets and firmware upgrades to offer future support and new capabilities, this new remote controller offers features necessary to boost efficiency so a single person can select and professionally control each shot across multiple BRC cameras stress free and without the need for individual camera operators."